A complete cargo management system, consisting of the cargo liner, and innovative Cargo 'locks'. The cargo locks and tray work together to keep your cargo upright and secure. This Cargo Logic Kit is made with a looped surface that looks like carpet, but resists stains and repels spills. And, it’s easy to clean—simply pull it out and hose it off. This is like a floor mat for your cargo area, not a tray! 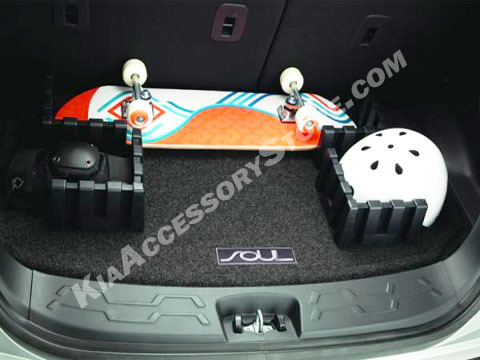 It does not fit on the floor of a base Soul cargo area, it would fit in the cargo area if I had the Kia Soul Cargo Cover which costs around $170. Uhhhhh, so sad that I don't have the cargo cover, it would look really nice if I did.